What type of nursing do you provide? Alliance Nursing provides pediatric and adult private duty nursing for patients with medically intensive needs. We also have three small group homes that provide a family setting for medically complex patients. Alliance Nursing is licensed to provide service to all counties in Western Washington. Do I qualify for nursing services? We will be happy to help you determine if you have coverage through your insurance company, Medicaid or other source. What types of patients do you have at your Adult Family Homes? Alliance cares for adults who are ventilator-dependant or have medically complex needs at some of our clients have had spinal cord injuries or advanced stages of multiple sclerosis or amyotrophic lateral sclerosis. Where are the Adult Family Homes located? The Camellia House is located in Lynnwood, the Lilac House in Kirkland, and the Foxglove Meadow house in Snohomish, WA. Does Alliance Nursing hire recent graduates? Yes. We will happily train new graduates. Do I have to have ventilator experience to work at Alliance Nursing? No. We offer on-site training as well as ventilator classes. Do I have to work a minimum number of shifts? While our clients and families appreciate consistency, we have many nurses that work part time to accommodate school schedules, other jobs, and family commitments. We offer flexible scheduling. 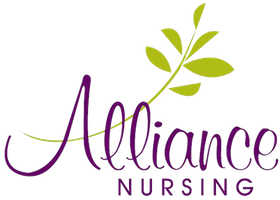 Does Alliance Nursing provide training? We train all of our nurses in the home before their first scheduled shift. The amount of orientation depends on the nurse’s experience and the complexity of care needed. We also offer Ventilator, CPR, and First Aid training classes in our Woodinville office. How often are nurses paid? Our nurses are paid weekly on Fridays. The pay period runs from the Monday day shift through the Sunday night shift, and is paid the following Friday. Contact Human Resources for log in information. Our philosophy as a company is focused on providing the highest quality nursing care possible. To support that goal, we have established an Employee Assistance Program (EAP) to provide support and guidance to employees who are experiencing life problems that may or may not be related to drugs and alcohol or may or may not negatively impact their job performance. Our commitment is to have a healthy, satisfied, drug-free workforce. Please feel free at any time to ask our Human Resources Department what our EAP offers.